September 2016 saw the SPSS repeat 2015’s successful initiative of taking our judges to our members, rather than expecting our members to come to us as in previous years. So, Hans-Heinrich Brüning (an international judge & breeder of Hanoverian dressage and jumping horses) flew in from Germany to join SPSS Chairman & Director, Jacke Mathieson (a dressage rider, stallion owner and breeder of competition horses and ponies) and together they judged more than 100 gradings and evaluations over 7 days at locations from South England to West Wales to South Scotland. For the first time for 8 years, there were two Stallion Gradings days and judging at both were Hans-Heinrich Brüning, Geoff Glazzard (competition horse breeder and former international showjumper) and Jacke Mathieson. At the first, which was in central England, six of the nine stallions forward were accepted then on the second day, in Scotland, all four of the stallions presented were accepted. The 2016 SPSS Supreme Champion Stallion title was awarded to the Scottish Grading Champion, Myles Lindsay-Brown’s lovely 9 year old Irish-bred Connemara Josie Jump (Currachmore Cashel x Moy Johnny’s Pride), who had previously showjumped in Ireland and, just 2 weeks before the grading, competed in the BSPS Mountain & Moorland Working Hunter Pony of the Year Championships at Horse of the Year Show. Then Reserve Supreme Champion was the Central Stallion Grading Champion, another lovely Irish-bred Connemara, Kippure Lancelot (Frederiksminde Hazy Merlin x Thunder Bay) who is owned by Tom McManus of Barrowby Connemaras. Both of these stallions impressed the judges and scored over 80%. Seven days of mare grading in 2016 saw over 40 magnificent mares presented in front of our experienced judges and, to everyone’s delight, all were accepted into one of the SPSS Mare Studbooks and twelve of them scored 80% or more to go into the Head Studbook. With one Mare Grading Champion title for each day of grading, it was the Welsh Champion, 5 year old Donatella-Kick (Clausholm Donatello x Attention) who edged ahead to be declared as the 2016 Supreme Champion Mare. Donatella-Kick is Danish-bred pony with a Welsh Section A sire and a Danish Warmblood dam and she was imported into the UK by her owner Amanda Castle in 2015 as a foundation mare for breeding sports ponies. The Reserve Supreme Champion mare was the first Champion of the week, the 10 year old German Riding Pony Jerry Lee Ut Deuten (Rocketti x Holsteins Jaimie). A foal champion in Germany, Jerry Lee has been competing in British Dressage competitions since 2012 and was awarded 9/10 for her flatwork, ridden by her 12 year old owner, Holly James, who bought her a few months earlier as a schoolmistress. Although both the Supreme and Reserve Supreme Champion mares were born outside the UK, they have strong links back to British breeding with both being over 40% Welsh. However, the remaining Head Studbook mares were all British-bred and had a range of passports including SPSS, Welsh, Connemara and Arab. 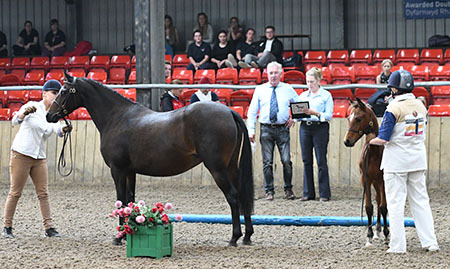 As in 2015, British breeders again presented some truly outstanding youngstock, with 18 of them impressing the judges with their athleticism, elastic gaits and modern sports type so that they scored 80% or higher and were awarded a coveted SPSS GOLD premium. Best of the best and awarded the 2016 Supreme Youngstock Champion title was the delightful SPSS passported filly foal, Jo Sholl-Evans’ Fairlight Rhiannon (Jonkers Metyo x Orchard Limb-Lopper) who scored an impressive 83.5% including four scores of 9/10. 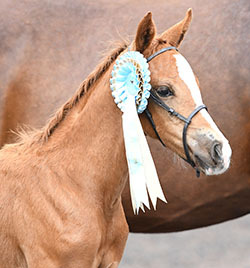 Described by the judges as “a stunning, elegant sport pony foal” and a “dancing princess”, both Fairlight Rhiannon’s sire & dam are Dutch-bred, SPSS graded part-bred Welsh ponies, making her over 25% Welsh. Rhiannon was also the Top Foal, Top Filly and Top Pony. The Reserve Supreme Youngstock Champion was another high percentage Welsh filly foal – Penny Walster’s Bathleyhills Mystery Lady (Langwedh Sunny Jim x unrecorded). With Langwedh Sunny Jim (Kalevan Mystic Pride x Ernford Bonanza) grading as Reserve Champion Stallion at the Central Stallion Grading the following day, Mystery Lady also has 2 SPSS graded parents as her dam was graded by the SPSS in 2012. Overall, 3 of the Gold Premium youngstock were sired by Bathleyhills Stud’s Sunny Jim and a further 3 by another of their SPSS graded stallions, Bathleyhills Monet (Casino Royale K x Matcho). Of the youngstock awarded Gold Premiums – and the evaluations were entirely open, so there was no requirement for any SPSS connection in the breeding – two thirds of them had an SPSS graded sire – so once again, success (at grading) is linked to success (at evaluation). Another interesting fact about these, the best of the 60 plus youngstock seen, is that, although their sires and dams are of a variety of breeds (including Arab, German Riding Pony, Welsh, warmblood horse and, of course, SPSS) and two thirds have at least one parent with a sports pony or warmblood passport, actually 60% of them have more than 25% Welsh blood (including two pure bred Welsh) and, of the remainder, only one has no Welsh ancestry at all! Please note that NO photographs on the SPSS site may be copied without the express permission of the photographer.